K-9 Klothes are available in colors to match your favorite Doggles® protective eyewear. Provide your dog protection from sun light and harsh weather while looking great! Your dog will have the best of fashion and function. On cold days, bundle up your dog in a K9 Klothes sweatshirt for extra warmth. 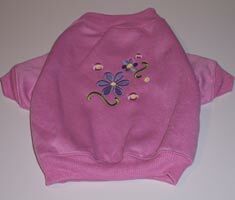 Sweatshirts for dogs in Doggles ILS coordinating colors. Very cute and stylish cold weather gear. Pink with flowers. Available in XS, S, and M.